Rougelites offer a replayability not readily seen in most games, as the complete randomization of level layout and enemy placement means a new adventure every time, often at the cost of permadeath, starting you back at square one, and a little bit of genericness, as the game has to be able to piece together randomized sections so they can't be terribly unique. I've been able to review quite a few rougelites lately that help you still feel progress through substantial permanent unlocks, namely Mothergunship and 20XX. While I can't get into a true rougelike (I got to review City of Brass and Bombslinger, each of which held tighter to the rougelike formula), adding the true feeling of progression in a rougelite made the Groundhog Day-esque gaming palpable as a true genre instead of a simple randomized world with a "git gud" attitude. MetroidVanias have always been a favorite of mine. They give the same general feeling as the rougelite: as you wind through mazelike areas, you slowly gain more powers that allow you to further explore until you reach the end. CastleVania peaked for many with Symphony of the Night, and for good reason. The structure and mechanics of that game distill down into pure gaming perfection. 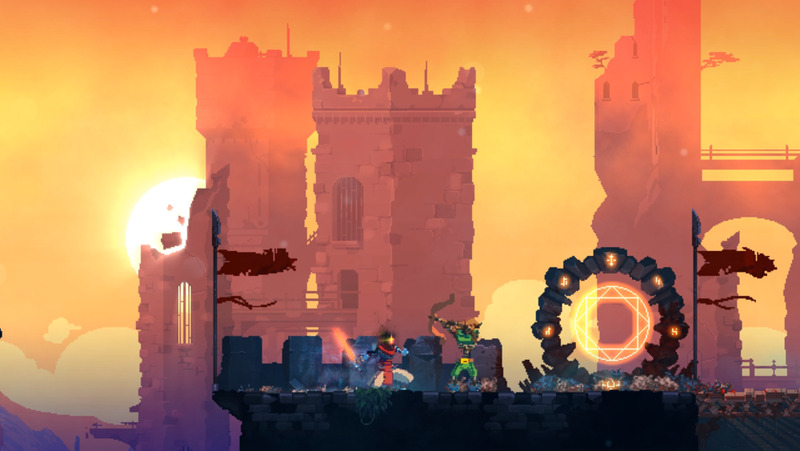 The developers at Motion Twin have married the two game styles mentioned above into what they call a "RogueVania" in Dead Cells. Playing as a mysteriously animated glob of crud/hero/prison escapee/test subject, it is your goal to escape your ever changing prison. Die, and you find yourself back at your original prison cell, reincarnated as if nothing happened. Each journey into the randomized dungeon, you slay enemies, some of which give you the titular "dead cells." Getting to the exit of an area allows you a bit of a reprieve. You run across a trader who will give you permanent unlocks (a health potion to take into the maze, the ability to start out with something better than a basic weapon) which takes you further. You find elite bosses that offer new abilities once defeated as well. This was perhaps my most favorite part of the randomization: despite being completely mixed each time, I would usually run into a jump I couldn't make with a pile of garbage underneath it. Finding the right boss in another world would grant me the power to grow vines from that sludge. Dying and returning, hitting that sludge pile and climbing would always get me to a branching path to a whole new level. As I continue playing, I see more and more things I can technically interact with that don't do anything right now. I know, in true MetroidVania fashion, eventual unlocks will allow whole new areas to be explored. The game falls right in place with whatever play style you want to do. You can go to clear out a whole level and get as many cells as possible before heading to the new area, maximizing your permanent unlocks, or you can dash through the first level in 45 seconds to get to a timed door in level two that has a ton of cells and bonus goodies behind it. Die, and you're back to the beginning, where your starting room does a great job of showing you where you are in your unlock progress. The game feels very smart with it's unlocks, slowly teasing you with new doohickeys that look like they do something you can't do just yet, and mysterious rooms that give a little bit more of the lore in-game. There's definitely a lot to learn, and it's shown via in-game text and reading rather than cutscenes, and cool story bits that are like the abovementioned timed doors, meaning each time you play you might come across something new. In my extensive playtime with the game, I didn't have many complaints. Across my myriad of hours, twice I came to a place I simply could not progress. Once I simply couldn't find an exit, even reviewing the entire map, and another I fell in a deep hole that I bet a future unlock would allow me to climb out of. There is a reset button, allowing you to keep your unlocks and start back at the beginning, and you can usually make a quick run back to the area you were in before. My only other issue was how template-ey it can be at times, like a skin of each area could be pulled over any platform section. Each area has it's own enemies and natural hazards, though, so they are unique enough to provide their individual challenges (the template is only really noticeable if you are trying to nitpick, which hey, is part of the old review process sometimes). Dead Cells does a great job of bringing something new to people craving a new Symphony of the Night style game. It adds a frantic pace to a MetroidVania, which allows an arcade-style action to fall into the traditional unlocking and expanding maze gameplay. Preorders on consoles could get the game at $19.99, so you may be able to get it on release day for that price depending on the speed. Digitally, the game is showing as base retail of $24.99 on all digital platforms, and Amazon listing the PS4 version at $29.99 and the Switch cartridge getting the "Switch Tax" at $34.99. I was able to review on PS4, which was perfectly fine, but if given the choice I'd likely get it on Switch. If the gameplay is not effected by the platform, I could see this as a wonderful bite-sized title for portable and big-screen gameplay. Without a doubt, Dead Cells is an easy recommend for me. The controls are just as tight as Symphony of the Night, and the weapons and powerups make this feel like a spiritual recreation of the title. The action, light humor, and wonderful musical score make for a wonderfully memorable game I'll be coming back to time after time. Special Thanks to Motion Twin for providing a digital PS4 copy for review!